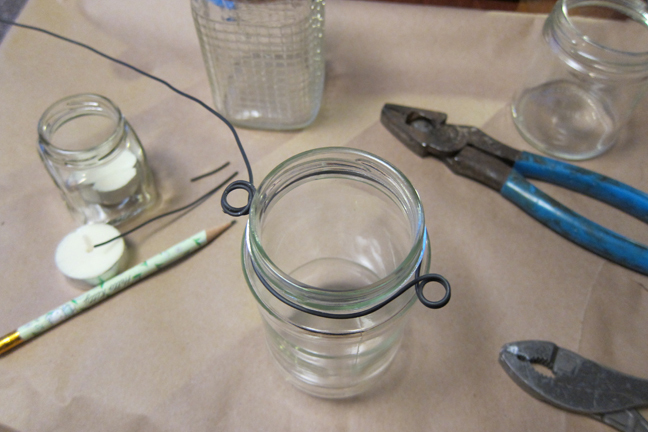 I wanted to learn how to make mason jar lights so I set about keeping pretty jars and snagging a few at garage and estate sales (at about 50 cents each). I read a few instructions online and found that some were better than others and ended up using a mishmash of the instructions I found online and my own experiences in bending wire when developing the little hangers that go on these cards I used to make. 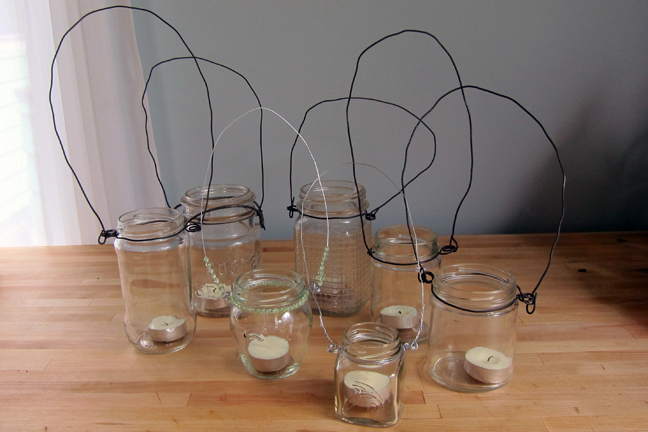 Start by getting cutting off enough wire to wrap around your jar lip at least two times (I like to have extra to play with). 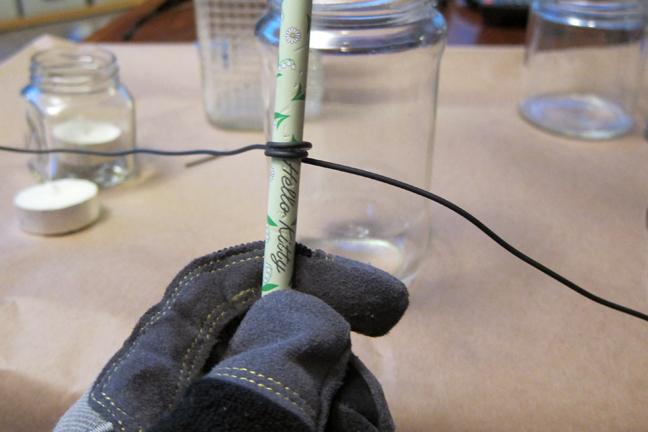 At the halfway point of the wire, bend it and wrap it twice around a pencil. My wire was rustic and made my hands dirty so I used gloves. 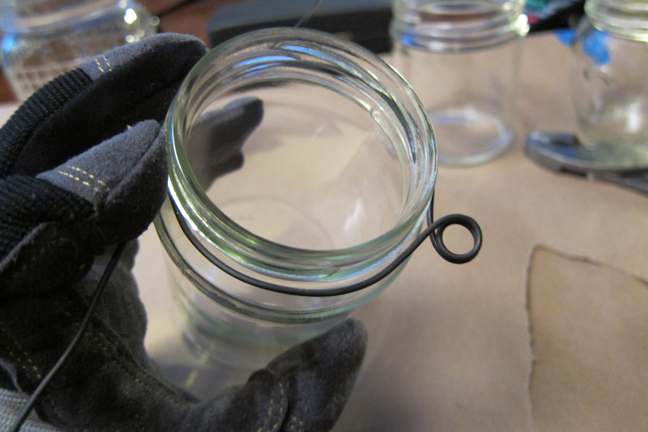 From there you press the little circle up to against the jar (under the lip, obviously) and wrap the long ends of the wire around the jar, shaping it as you go. Now grab your pencil again! 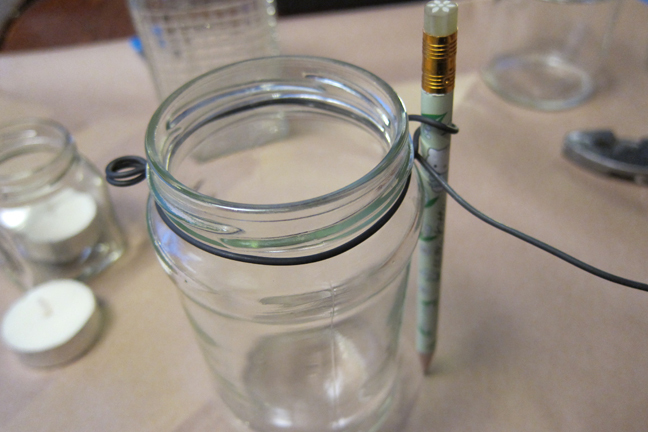 Using the pencil as a form, wrap the wire around it twice. I wrapped each side once but it could work any number of ways. This part was tricky, I must say, because my wire was rather stiff. It didn’t make for the tidiest finished circles but it will be hanging in the dark so I let myself off the hook in this case. Remember: Part of the charm is that it’s not manufactured! 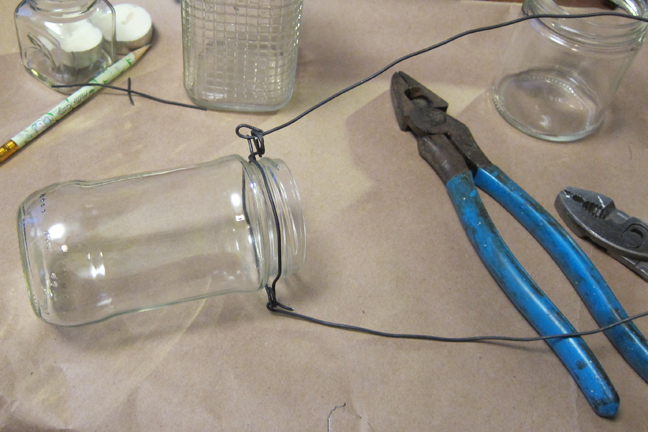 Once your second loop is formed, snip the wire as close to the jar as you can and tuck in the sharp edge. 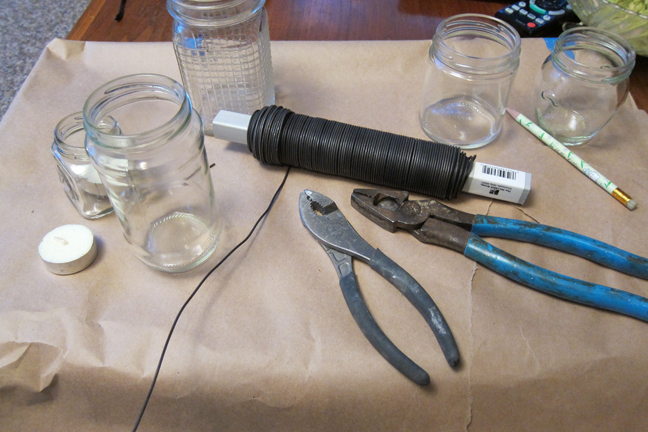 My cutting pliers were bulky but if you use lighter wire/smaller cutters you might get a more delicate result. The easiest part is the handle. Just take your wire, cut a piece to a length as long as you’d like for hanging, and hook each end up under the loops you created. I tried several variations including making the whole thing one long piece of wire, and I did not like how that turned out. Two pieces was simplest and allows you to make the hooks as long or as short as you’d like (and swap the hooks out accordingly if you decide to hang them somewhere else later). I made an assortment, with a variety of hook styles and wires. As you can see, I also made a tiny one with dainty wire and a decorative one with seed beads placed on the wire to put it on an outdoor table. They looked pretty cute lit up!